Almost all the surface water Syria uses for agricultural production is shared with neighbouring states. The main rivers include the Euphrates and its tributaries, the Tigris, Yarmouk and Orontes rivers. Despite the current agreements with Turkey, Iraq, Jordan and Lebanon, the planned extensive water development (dams) upstream of Syria could negatively affect the surface water flow into Syria. An increased use of upstream surface water will also lead to a deterioration in the quality of water inflow due to increased salinity of upstream irrigation return flows. Also, higher demands by downstream riparian states may eventually further impact Syria’s ability to use (more) surface water. Historically, the Euphrates and Tigris were domestic rivers within the Ottoman Empire. With the dissolution of the empire and the emergence of Syria and Iraq as independent countries in [1946 and 1932 respectively], the rivers acquired international status, and new treaties and protocols were established to govern the allocation of water resources. All agreements, starting with the Treaty of Lausanne in 1923 between Turkey, Britain (for Iraq) and France (for Syria) to the tripartite talks of the so-called Joint Technical Committee between Turkey, Syria and Iraq – held for the last time in 1997 – were bilateral, non-binding and largely ad hoc. Several conflicts, both political and military, caused a deadlock in water management between the countries with a refusal to sign the 1997 UN Convention on International Watercourses. In recent years, heavily armed non-state groups have weaponized international waters, and major water infrastructure in Syria and Iraq have come under threat. Syria shares six rivers with other countries: the Euphrates (with Iraq and Turkey), Tigris (with Iraq and Turkey), Orontes (with Lebanon and Turkey), Khabour (with Turkey), Sajur (with Turkey) and Balikh (with Turkey). 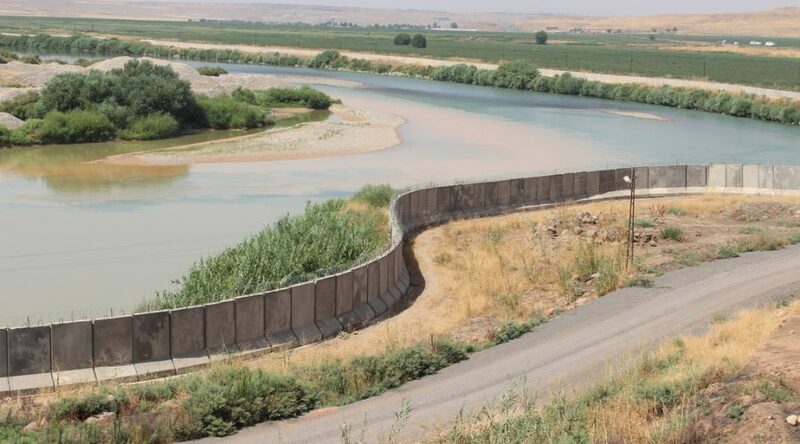 Some agreements are described in these special Fanack reports Turkey-Syria Relations: Between Conflict and Cooperation, Turkey’s Transboundary Waters and The Asi River and the Turkey-Syria Friendship Dam. The timeline below presents the history of the riparian countries’ interaction. Figure 1: Tigirs and Euphrates timeline. The primary cause of the disputes over the Euphrates and Tigris rivers lie in Turkey. In 1977, Turkey announced plans for the region’s biggest water development project ever, the South-eastern Anatolia Project (GAP), which included 22 dams and 19 hydropower projects. GAP is intended to provide irrigation, hydropower and socio-economic development. The project area encompasses south-eastern Turkey, around the headlands of the Euphrates and Tigris rivers, and covers approximately 10% of Turkey’s total population and territory. The project is designed to harness the vast, untapped water potential of the area. In 2005, the natural flow arising in Turkey was 28.3BCM, 89% of the natural flow of 31.8BCM. The balance – 3.5BCM or 11% – arises in Syria. The Euphrates is the main source of water for 27 million people across three countries. The Ataturk Dam in Turkey can hold over two years equivalent of the entire natural flow of the Euphrates. By 2003, hydropower production was 96% of capacity. However, the major impact on downstream water resources will only be felt in the coming years. The irrigation programme is years behind schedule. Current irrigation diversions from the Euphrates in Turkey are only 20% of the planned levels. Syria, too, has major plans to double the area irrigated by the Euphrates. By 2013, the flow into Iraq had . The dwindling quantity, exacerbated by drought conditions in the 2000s, had already led to a movement of people who depend on the river. As mentioned above, the water-sharing arrangements currently in force – that Turkey will release to Syria a minimum of 15.7BCM per year and Syria will release to Iraq 9.1BCM – are well below recent use levels in Iraq of 15BCM. The lack of cooperation between the three riparians has prevented the development of an integrated water plan for the entire basin and creates particular risks for Iraq as the downstream riparian of a diminishing and increasingly uncertain flow. Table 1. Estimated year of depletion of Euphrates river water.